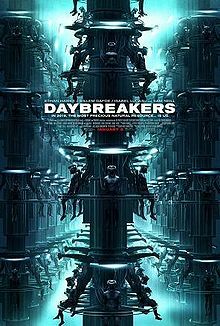 Directed by the Spierig brothers, Daybreakers starts at the end that most vampire movies and tales fear to reach. It is 2019, ten years after a virus has turned most of humanity into vampires. While Bram Stoker’s iconic vampire Count Dracula sought to conquer and colonise the human population but was thwarted, Daybreakers shows the possible result if his project had been successful. Vampire fiction usually has vampires serving a metaphorical purpose as society’s outsiders. Even when their existence is known about (such as in True Blood) they remain a minority, the other to be feared and distrusted. In Daybreakers vampires are no longer the outsiders of society, they are society. The world is turned on its head. In the daytime the streets are deserted. When night falls the vampire population come out to go to work and carry out their business. Vampires run the state, business, police and army. They no longer lurk in the shadows. They openly walk the streets, grabbing blood coffees, vacantly staring into space while they wait for the subway. They are us. Meanwhile, humanity has been reduced to being farmed for blood by merciless vampire corporations. The army hunts down small bands of survivors. The new society faces a crisis; vampire colonisation has been so successful that their food supply is running dry. There are no longer enough humans left to provide blood. As shortages begin a vampire underclass begins to emerge. 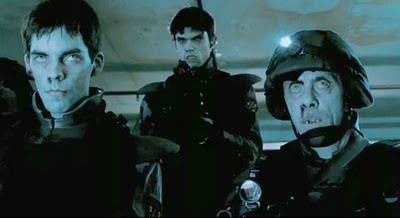 Starved vampires who can’t afford blood begin to mutate and become “subsiders”, hated by the decent vampire population. The civilised vampire society stands on the brink of chaos and destruction as food (sorry, blood) riots begin to break out. A vampire scientist is searching for a solution: a blood substitute or possibly even a cure for vampirism. But he has to contend with the profit grabbing priorities of the corporation he works for. I won’t spoil any more of the plot for you. That said, it’s a vampire film and a dystopian one at that. So if you like those things and you haven’t already, you should probably watch it.